Accompanied by 38th Ward alderman Tom Allen, the parents presented evidence of the success of the full-day program in their speeches and in a packet that included information about Thorp, “a school of distinction,” letters asking for restoration of the 1.5 kindergarten positions, a synopsis of research illustrating the benefits of full-kindergarten, and petitions. At the May 26 Chicago Board of Education meeting, 38th Ward alderman Tom Allen, (far right) joined LSC president Margaret Chaet (at podium) and other parents from magnet school O. A. Thorp, 6024 W. Warwick, to highlight the success of the school’s full-day kindergarten. Speakers Allen, Chaet, and Virginia Sabella (in center, behind Chaet) implored Board members and CPS CEO Ron Huberman to restore funding to Thorp’s three, full-day kindergarten classes. Huberman assured the parents that once Springfield “leveled” the funding, the Board would fund full-day kindergarten again. However, according to the Board’s most recent budget documents — presented at the April 28 Board meeting — CPS restored $32 million it had cut to “early childhood programs” when Illinois passed pension legislation that gave the board an extra $400 million for the coming school year. (See cps.edu for Power Point budget overview.) Despite the influx of state money, the Board and Huberman didn’t restore the $16 million they say was cut from full-day kindergarten. Huberman is claiming a $600 million deficit, but many careful observers are challenging his claims. The total CPS budget is $7 billion. Substance photo by George N. Schmidt.Alderman Allen spoke of the success of the K – 8 magnet school, which serves a racially and economically diverse body. LSC President Margaret Chaet, whose children have attended the school over the past 12 years, echoed his comments by noting the high-performance of the school’s 820 students and the importance of their early education. “My husband and I are deeply committed to Thorp, and truly grateful for the excellent education our children have received there. An education, I might add, which began with full day kindergarten,” Chaet said. Parent Virginia Sabella also spoke about her children’s experiences at Thorp and her worries about next year. “I have two children who have gone through Thorp’s full-day kindergarten,” Sabella said. “Our teachers have been able to accomplish amazing things. (From left): O. 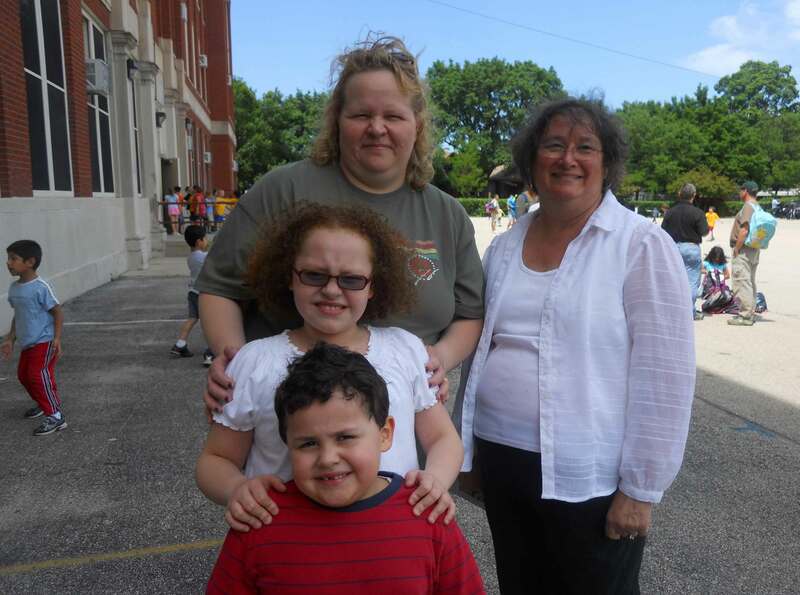 A. Thorp parent Christl Gomez, her children — sixth-grader Emma Gomez and incoming kindergartener Matthew Gomez — with Carol Battaglia, one of Thorp’s three kindergarten teachers. Like many preschoolers headed to Thorp, a K–8 school, Matthew attends a full-day program in another school. The majority of kindergarteners have attended preschool or other outside learning experiences before beginning Thorp. Parents fear that the half-day program will be a step backwards for their children. Parents and teachers are concerned about what aspects of the curriculum — academic, social, and emotional learning — will be lost when Thorp’s successful full-day kindergarten is cut to two and a half hours. Observers worry that the only thing not effected might be the CPS kindergarten DIBELS testing requirements. Substance photo by Sharon Schmidt. “My children finished kindergarten beginning to read, write, spell, and do basic math, not to mention science and social studies. They had art, music, library, PE, and technology. They were able to foster friendships, resolve conflicts, participate in assemblies, and learn from older students through our writing partners program. I believe this well-rounded base has lead to making our school one of the best in the city. Board president Mary Richardson-Lowry thanked the parents and called on Huberman. He told them that CP shares the commitment to full-day kindergarten, but that funding it is contingent on receiving state funds. “Thank you for your commitment to come out,” Huberman said. “We absolutely share your commitment to full-day kindergarten. We think it’s absolutely critical. As many of you know we have been lobbying the state very hard, as have many of you, for funding. In the event that the state comes through with level funding for education, and it’s what we’ve been arguing for, then it is our plan to fully restore the kindergarten program to this year’s level. “I can tell you I was on the phone a good chunk of the day with legislators in Springfield. I am very cautiously optimistic that we may achieve level funding. If we do, one of the very first things to get restored will be the full-day kindergarten programs to last year’s level. O. 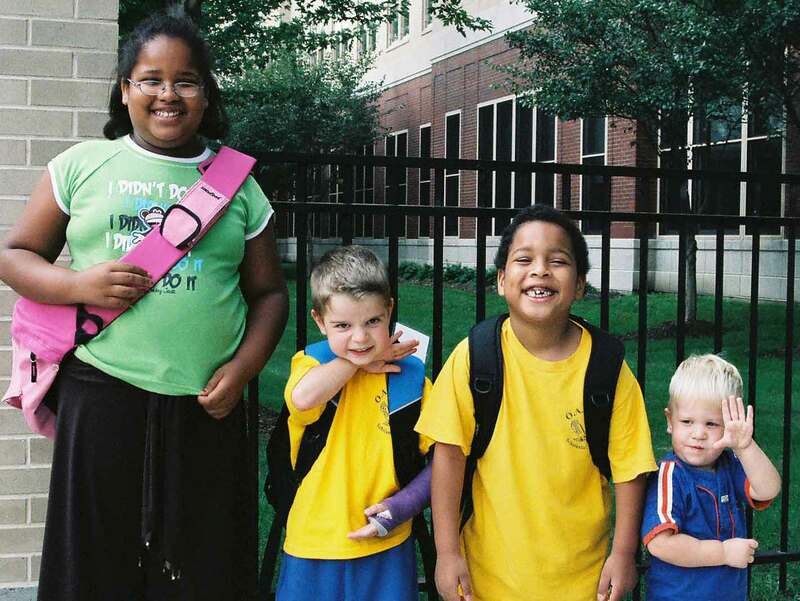 A. Thorp students Sarah Mulinge, Sam Schmidt, and Jackson Mulinge are met by Josh Schmidt at their bus stop at Portage Park school in September, 2006. Most students at the magnet school ride the bus. After waiting four years to join his brother at Thorp, Josh will finally enter kindergarten this fall, but as a half-day student he will not be able to travel to and from the school with Sam. All 87 families who enrolled their 2010-11 kindergarteners at Thorp had counted on the full-day program when they chose the school. By cutting full-day kindergarten, CPS CEO Ron Huberman has left parents scrambling to make travel, child-care and academic enrichment arrangements for their children. The CPS Office of Communication has not yet provided information about which other schools’ full-day kindergartens Huberman cut. Substance photo by Sharon Schmidt. “As you’re aware we’ve used local dollars to back-fill for a state reduction to restore pre-k programs because we’re committed to the education of our students at the earliest years. On Monday CPS announced it won't raise elementary class size and will restore kindergarten, Azam Ahmed of the Trib reports. After hearing the news, a Thorp parent contacted principal Kathleen Bandolik for confirmation. She says it's true. Great job Thorp parents and others for pushing this issue. What about the teachers already cut? I'm pleased to read about the partial reprieve but what about the coaches, reading literacy, music teachers, etc. that have already received layoff notices and cutbacks in hours? Will those be restored too?